Well the day finally arrived, turning out day with the cows. It is a good day when they go outside as they live inside more than outside, so when they go do out to for the summer it makes life a bit easier – especially during silage season when we are late back on a night and often have to set off early in the morning. Before they went out, all the calves had to be dehorned as they are more dangerous with them and don’t sell as well. We use an iron that is the right size to burn the horn out and if it is burnt out right it won’t regrow. We have a small crush to hold the calves in, which makes it easy to dehorn them and sort them out if there is anything wrong. Before this, they are given an anaesthetic so that they don’t feel anything normally. We soon had them sorted out and ready to go but it was a wet day so they had to wait until the next day to go out. We don’t like to turn them out when it is raining because the sudden change could trigger the calves to start with pneumonia. We sorted the heifers out into two different packets, the Limousin Cross and Blue Cross and the Angus Cross and Simmentel Cross. The Angus and Simmentel heifers were put into one field as these had been AI’d and were the ones that seem to have held. Whereas the others, Limousin and Blues, went in a different field with some cows and calves as we weren’t sure that they had all held to AI. We thought that we had all day to get things sorted and all the cows out before we started silaging. But farming never goes according to plan! Whilst my dad, Luke and I were sorting the heifers out, my Grandad came and said that I had to go and mow some grass at dinner time, so the pressure was on to get the cattle sorted out before I had to go off, but we managed it. As well as silaging for other people, we have managed to mow some of our own grass. It’s been mown earlier this year, to try and get a better quality silage to feed in the winter. If you make good silage it keeps the feed costs down as you don’t have to use as much bought in cake or not even use it at all. It makes sense to make better silage instead as there is not as much feed value in old silage, meaning the stock don’t do as well. 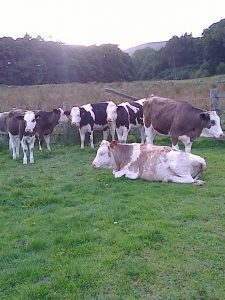 We were able to make this early forage since it was not on the farm but at Summerbridge, which is lower down the dale. This allows us to only mow the better meadows at home as some of them are very steep and are difficult to get bales out of if the weather turned wet. Also as it’s lower down, the sheep are shut out for longer and the meadow produces more grass, meaning that we get two cuts of grass off those fields compared to just one at home. With getting two cuts off it means that we can get a better quality silage, as the second cut is younger grass and is better sometimes. We only took the sheep out of the meadows at home two weeks beforehand, so we’re lucky to have this grass lower down the dale.